This film is a part of a Double Feature with Animal House. When two movies that are screening in the same theatre are grouped under the same thematic heading, one ticket is good for both features when viewed back-to-back on the same day (except as noted). Join us in doing our part to ensure no child goes hungry in Central Texas especially during the summer when school meals are not an option. We’ll be accepting healthy non-perishable food in the lobby before the film for the Central Texas Food Bank. Items most requested: Peanut Butter, Canned Chicken Breast/Tuna, low sodium canned vegetables, canned fruit in it’s own juice (no sugar added), dry pinto beans, brown rice, non-fat dry milk powder, 100% whole grain cereal. Not Accepted: opened or expired items, breakable packaging (no glass). 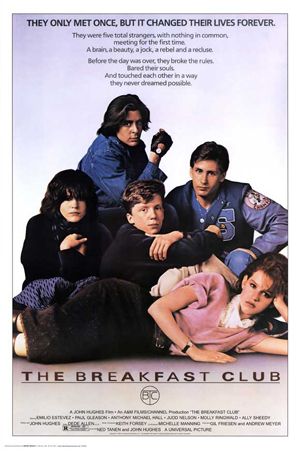 Emilio Estevez, Paul Gleason, Anthony Michael Hall, Judd Nelson, Molly Ringwald, and Ally Sheedy. The young actors behind the brain, beauty, jock, rebel, and recluse so captured the nation’s imagination that they were granted their very own collective nickname: The Brat Pack. As they serve time in detention, they begin to see each other as more than simple clichés and, in doing so, take the final step toward adulthood.